How much can a 4 ft. by 3 ft. deep container hold? I was conducting my usual news search this evening when I ran across this story not long after it was posted by The New York Times. I couldn’t believe it. This is wrong. Just plain wrong. GHAZNI, Afghanistan — Capt. Kirk Black, who trains the Afghan police in this impoverished province, developed a practiced skepticism about claims of innocence during a decade as a Baltimore police officer. But last January, when relatives of an Afghan imprisoned at the Bagram military detention center begged him to look into the case, he agreed to listen. Eventually he became convinced that the detention was a case of mistaken identity and put the family in touch with a lawyer. Soon, Captain Black was facing a potential legal battle of his own. One of his senior commanders ordered him not to discuss the case, and the military sent an officer to investigate him. He retained military defense counsel. In March, Captain Black said, he was ordered by a commander several rungs above him to “toe the party line” and not discuss Mr. Khan’s guilt or innocence. He was also ordered not to allow two journalists who visited his base to accompany him on routine trips to Waghez. A few days later, as part of an official military investigation, a more senior officer unexpectedly arrived at Captain Black’s base to question him about conversations with Mr. Khan’s family and with this reporter. The investigating officer also sought a sworn statement from this reporter, who declined. A military spokesman in Kabul did not respond to questions about why the decision was made to investigate the captain — or whether he would be punished. WTH? Investigate him for what? Trying to help Afghans? Isn’t that his job? Incidents like this, and the Haditha Marines, and CPT Roger Hill and 1SG Tommy Scott, and so many others make my blood boil. I also discovered Michael Yon linked to the story with, Injustice and Captain Black. He thinks there’s something to the story. Vampire 06 at Afghanistan Shrugged is a Team Chief for an Embedded Training Team with the Afghan National Army. His latest post, What Price Victory for an Afghan ETT?, will give you an inside look at a little piece of COIN (Counterinsurgency). While you’re there, be sure to read I Shoot You Because I Care! (Heh. Loved that one! ), as well as ETT: Mutt Soldiers. Take some time to read his prior posts. Heck, just bookmark the blog. Go back later and read more, and stay up to date with his new posts. You won’t be sorry. You’ll get some real insight into what ArmyBro and the rest of our ETTs do over there. Air Force Staff Sgt. Candance Benson, Joint Operations non-commissioned officer, Air Force Staff Sgt. Marjorie Moore, Joint Intelligence Operations Center NCO, and Tech Sgt. 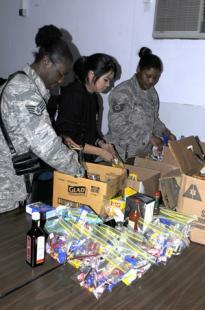 Ramona Boulware, Logistics NCO, fill humanitarian assistance bags. Volunteers filled bags with a variety of foods, schools supplies, clothes, and toys. Thanks to all this country’s Citizen Soldiers, but especially our Citizen Soldier. I am so proud of you! Stay safe out there, ArmyBro! Kid Rock. Dale Earnhardt, Jr. The National Guard! The full version, including the behind the scenes making of the music video, is at the National Guard Warrior page. Good stuff. You can also download the song at the site.